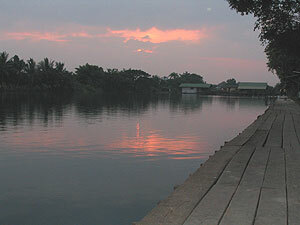 Now Nam Lake is a Thai owned fishing park and is situated on the outskirts of Bangkok some fifty km’s outside Bangkok city centre.The fishery is a mature twenty rai / eight acre fishery with history dating back some thirty years containing a wide variety of Asian Carp and Catfish species. Now Nam fishing Lake is a long elongated body of water with varying depths ranging between three and five metres. Fishing at this venue is permitted from only one bank (sheltered) with the out of bounds bank being bordered by a residential estate. The lake has very few snags and has a fairly uniform depth of three metres. The snags/structure that do exist in addition to the out of bounds bank regularily produce large hauls of fish. The lake responds well to sliding float / bread set ups in addition to method style tactics using locally produced flavoured groundbaits. 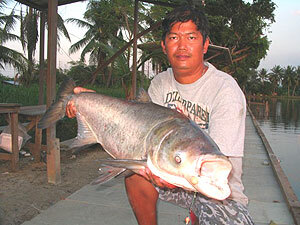 The lake holds a large stock of Bighead Carp with weights ranging between fifteen and twenty kg’s. The lake also holds a wide variety of Asian Carp species with Giant Siamese Carp reported to reach sixty kg+ in addition to large Rohu (Indian Carp) upto fifteen kg’s, Mrigal (small scale mud carp), Juliens golden price carp, Silver carp and small Common Carp. In addition to the various carp species that reside in this lesser known fishery, the lake holds various catfish species with a large head of Giant Mekong Catfish present upto one hundred kg+. The lake also holds specimen sized Striped and Chaophraya Catfish. The fishery can be described as a highly prolific venue offering multiple carp and catfish captures to the visiting angler(s). Basic facilities are available on site with W.C’s and a small shaded restaurant serving a basic selection of Thai food throughout the day. The Fishsiam team has captured numerous Big head Carp from this venue and feel that it represents the best opportunity for the visiting angler(s) to capture Big Head Carp. In addition there are some stunning ornamental Koi Carp present which are caught regularly over large beds of groundbait. This venue can be visited on a daily and weekly basis and can be combined in one of our tailor made angling holidays specially designed to the clients specific angling requirements. Please note that we are not currently operating fishing trips to this venue due to fish losses caused by recent flooding in Bangkok.